Sacagawea wanted to see the ocean, and also the giant fish that had washed ashore and promised the potential for delicious blubber (yeah, the giant fish was a whale) for the wintering Lewis and Clark Expedition at Fort Clatsop. On January 7, 1806 she got her wish. After several days of travel, the ocean was spotted, and the crew was able to purchase some salt and whale blubber (tastes like pork!) to help them get through the rest of the winter. Set out at Day light, porceded up the Creek about 2 mile and crossed on a tree trunk the Salt makers have fallen across, then proceeded on to the Ocean ¾ mile . . . assended a Steep mountain, . . . we hauled our Selves up by the assistence of the bushes . . . the Steepest worst & highest mountain I ever assended I think it at least 1500 feet highr than the Sea imidiately under on the riht. we met 14 Indians loaded with blubber . . . 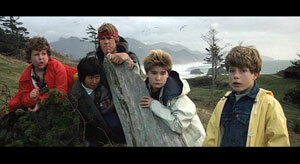 The explorers were near what is nowadays Ecola State Park, best known to movie goers as a location in Kindergarten Cop and The Goonies.